Post arrival at Delhi airport / Railway station, pick up and transfer to Nainital. On arrival at Nainital, check in to hotel and rest of the day at Leisure. Nainital is the largest town in Kumaon and also is one of the favorite hill resorts of India. A lot of hotels can be found in the forested hills surrounding the lake. A busy bazaar is also there in Nainital for travelers to pick up local souvenirs. 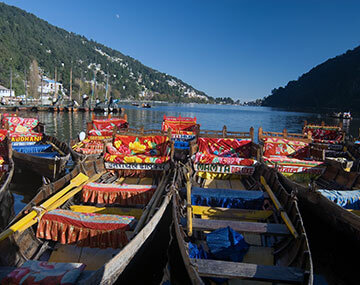 Nainital is a perfect place to unwind and relax, eat good food, go boating on the lake and horse-riding around the town. Overnight stay at hotel in Nainital. Today after breakfast, Spend the day visiting places of interest in Nainital, such as the Naina Devi temple, Mall Road, Tiffin Top and the Zoo. You can also take the ropeway to the View Point. Also visit Bhimtal lake, which is an hour's drive away. In the evening you might like to go boating on Naini Lake. Today after Breakfast, check out from hotel and drive to Kausani. En route visit Ranikhet an attractive town in the Himalayas fringed by the rivers Kosi & Gomti. On arrival, check in to hotel and rest of the day free to relax. Overnight stay at Hotel. After breakfast visit the Gandhi Ashram from where Himalayan peaks are clearly visible; also visit some other viewing points in town. Go on an interesting excursion to the Baijnath temple complex, along the Gomti River; you’ll come across shrines built between the 9th & 12th centuries that are an architectural delight to watch. Overnight stay in Kausani. Today after breakfast, Check out and drive to Corbett. Arrive in Corbett and check into your hotel. The rest of the day is at leisure. You may go for Evening Jungle safari on direct payment basis. Established in 1936, Corbett Tiger Reserve was the first national park of India. It has spread further since then and now also includes the surrounding forest lands. It is named after the legendary Jim Corbett (1875–1955), the British hunter who introduced Kumaon on the world map with the help of his book “The Man-Eaters of Kumaon”. Overnight stay at hotel in Corbett. Today, you may opt to take another game drive in the Park or perhaps take an excursion to the Garjiya Devi temple, a sacred Shakti shrine near Ramnagar. Alternatively, visit Kalagarh Dam where a large number of bird species can be seen. Overnight stay at Hotel in Corbett. Today after breakfast, check out from the hotel and drive towards Delhi airport for onward journey. Uttarakhand will give you the perfect respite from your busy city lives and take you to the lap of nature. From hills to forests, Uttarakhand`s magic is sure to mesmerize you in every way. Diverse in its geography, Uttarakhand will pleasantly surprise you with what it has to offer. Known for pollution free air, lush green forests and valleys and rich local cuisine, the magic of Uttarakhand unfolds with every stop in your journey as a tourist. Uttarakhand tour packages are abundantly available from all parts of India because of its popularity among tourists around the world. Summer months see a lot of demand especially in the holiday packages for Nainital among all the Uttarakhand tourism packages. While a solo Nainital trip package will cover only a couple of days, combination Uttarakhand holiday packages are longer. Our packages are not only cost effective but also the best is what will be given to you in the price that you pay. Hotels are carefully chosen for your comfort and aids in making your trip even more memorable. Since our package tours covers everything to give a hassle free travel experience to all our customers. Our arrangements will not disappoint you and you do not need to intervene in any of the bookings or sight-seeing schedules but just stick to our itinerary and just sit back and enjoy your trip! A total of six Breakfasts and six dinners will be provided. Personalexpenses like telephones calls,laundry, drinks, tip, etc. In case the mentioned Hotel is unavailable, similar hotel will be arranged for. Additional supplementary charge will have to be paid if the travel datesare during any national holidays, long weekends, festivals, etc. All the mentioned rates are subject to change due to changes in Govt. taxes, etc. BookOtrip.in reserves all rights to alter/modify or even terminate the given offer at any time without giving any prior notice. I had gone to Nainital with my friends. I had done trekking,Boating,Rappelling and the best part was camping. Oh my God I had a good time over there.